Innovative use of technologies: It does not matter if the company uses new or existing technology. However, it is crucial that those responsible use technology innovatively. Improve or create a process, product, or user experience: Companies can use technology to change or even improve their current situation. For example, a hospital can connect wireless sensors, an Internet of Things (IoT) platform, and analysis tools to a heart rate monitor to send vital data to a specific nursing contact center. Then, the nurses can more quickly intervene if problems arise, benefitting the patient. Deliver measurable business value: Companies expect their digital projects to provide quantifiable or added value to their business. Let’s go back to our healthcare example. In this field, providing quantifiable value leads to a better initial customer experience. In this scenario, patients can receive phone calls from nurses based on the evaluated sensor data, which can provide insights that improve patients’ quality of life and even save lives. Further, sales can also increase if patients monitor their health information because they will know when they need to go to the doctor or need new medication. Rapid implementation of a digital transformation strategy: Firms should implement their digital transformation strategy as quickly as possible, ideally within six months. This tip does not mean that companies need to complete the entire transformation project within six months. However, there must be a checkpoint or milestone with measurable changes within this time. Without a tight deadline, competitors may launch products or services faster, stakeholders may lose interest, and budget may expire. Digital transformation is the current trend, and an integral part of this process is transforming your digital infrastructure. Although the connection seems plausible at first glance, there is a lot of work behind it. To pave the way to becoming a digital company, you need to do more than just create a mobile app. Ideally, your digital transformation will enable your business to interact better with your customers, make your core business more effective, and unlock new market segments through new products and processes, including data analysis. Depending on the industry and the company, how your digital transformation works will differ, but the basic idea remains the same: The added value of data becomes a central element of your business strategy. While some services can be moved to Office 365 or Salesforce, workloads remaining in your data centers are becoming more strategic like with the introduction of digital products. The job of IT departments is changing. The focus is no longer on general application best practices but on defining and implementing methods and workflows that are tailored to your business. Digital transformation requires the transformation of your company’s infrastructure. The job is not only to handle the larger volume of incoming and outgoing data but also to provide agility and flexibility. The more innovative a company becomes in handling data, the higher the likelihood that new products, services, and initiatives will come to market faster. How should transforming your infrastructure be addressed? First, a piece of advice: It’s not just about buying the latest hardware and software. We have been making this traditional purchase for decades, and we will continue in this direction, but purchasing this technology is not a part of infrastructure transformation. Contrary to prevailing opinion, using the cloud does not count as infrastructure transformation. For example, including cloud providers like Amazon Web Services (AWS) or Microsoft Azure has benefits and may feel transformative, but that’s not enough to constitute a full infrastructure transformation. Eliminate bottlenecks: Your infrastructure should ensure that the right data can be accessed at the right time. To accomplish this goal, it must be able to increase speed so that new workloads can be added without negatively impacting performance. This is especially important for business intelligence and analytics workloads, and developers need the fastest possible data access, as well. Multi-generation architecture: Infrastructure demands scalability, and new hardware is introduced in shorter cycles. Data must remain available even with a generational change. Even with changing requirements, data access must be predictable, accessible, consistent, and online. Hardware abstraction through software-defined storage (SDS) is one way to meet the challenge of introducing new generations of hardware. These are simply integrated into the overall pool without affecting data access. Immediate roll-out: As new requirements arise, access to digital transformation cannot take months of waiting for approval and then take several months to implement. Many technologies accelerate roll-out, such as converged or hyper-converged infrastructures based on SDS. Access to the public cloud can also be high-speed. While not suitable for all data types, the cloud can significantly speed the provisioning of new storage. The ability to start new workloads in the cloud or your own data center using universal data access. 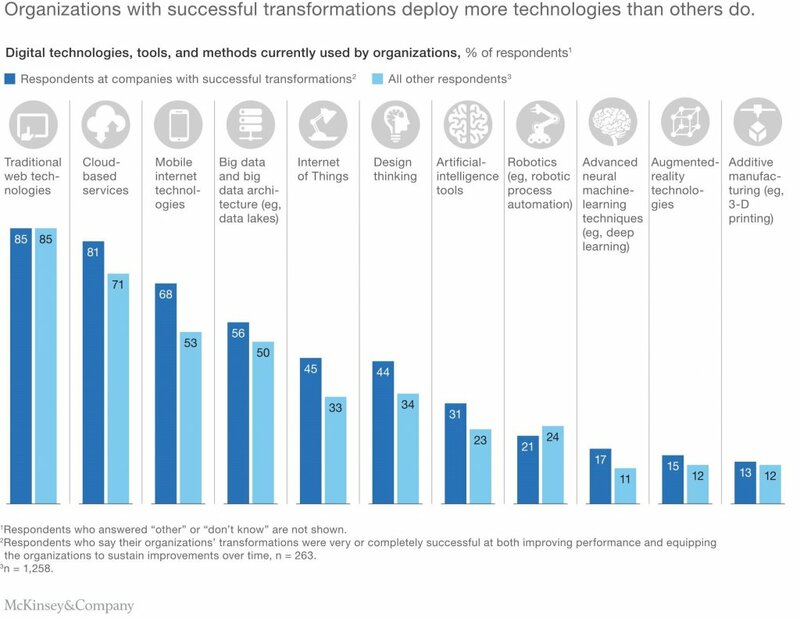 Research compiled by the McKinsey Insights further reinforced that companies with successful digital transformations are more active in deploying newer technologies than other companies who were less successful in their digital transformations. The list of strategic attributes that you should employ when striving for digital transformation will get longer as new innovations become available. Today, your IT department may be busy maintaining data center or cloud operations but make sure that they are keeping an eye out for new opportunities. As your company gets serious about digital transformation, daily maintenance needs to be drastically reduced, and your focus must be on transforming digital infrastructure. Luckily, behind each of these initiatives is a well-functioning network that securely and cost-effectively supports real-time applications. Many companies usually start their digital efforts by analyzing their core technologies in areas such as network, security, and communication. Without a strong foundation, many innovative applications work inefficiently, leading to a poor digital transformation implementation. Sreejith Partha (Sree) is the CEO of Practical Logix, leading an outstanding engineering and product team. He enjoys being hands on, when it comes to product strategy, architecture and processes. Sree has cultivated a culture at PL where no one is secluded from the bigger picture, helping the stakeholders trickle down the passion of their brand to every team member, producing a better outcome.